The Schipol airport is a zoo. We arrive in Dublin in midafternoon to a brilliant sun and pure cool air. The airB&B is disappointing. A great location but the room is tiny, the bed is narrow, and the air in the entire apartment is stagnant. Something wrong with air circulation. The bathroom is a virtual sauna at all times. Sharing a bathroom (with a pleasant young Canadian couple) is no longer my idea of comfort. We go into the city right away. The center – and we live in the heart of it — does not look like any other European capital, though it has elements of several of them. Like Budapest and Paris, building heights are uniform and none seem higher than about 5-6 floors. It makes Dublin cozy. No particular architectural style dominates. Some buildings are red brick flat rectangles with no adornments, others are quite decorated, others again have the 19th century opulent Budapest look or some Greek revival idea. In some sections of the city the colorfully pained Edwardian front doors are very charming. Modernity has also made its mark here, including quite a few brutalist monstrosities. The sidewalks are bustling with people, young women are stylishly dressed. No blacks, Hispanics or Asians to speak of. Many children and pregnant women; the economic downturn clearly has not erased all hope for the future. Very few people are glued to their smart phones. Something friendly in the air, or perhaps I am influenced by my expectations of the Irish people. We walk around the center, at times in circles, checking it out, and also looking for a place to buy a new suitcase (my old cheap Chinese purchase broke). We locate the main points of interest, rest in the park. Girls on the lawns displaying their charms and, like in the Netherlands, are definitely underdressed for the encroaching chill of the evening. It seems to me that people in these cool climates try to will the temperature upward by just dressing for it, especially on sunny days. The double decker busses drive like mad in their designated lanes. We need to be very careful when approaching the curb. We see no traffic jams, even during rush hours. It seems that the rivalry between public transit and the private car is heavily leaning toward to former. This city is not very big. Dinner in a stylish Asian restaurant near the shopping center where in desperation I buy a cheap suitcase that I hate, then return it 15 minutes later. The restaurant is full of young hip people, animated and engaged. After dinner we walk toward the river to the famous Temple Bar where the pub life concentrates, though pubs are everywhere in this city. We stop in one pub where a guitar player sings a mix of songs. Some people join. Lively. We have our first glasses of Guinness. Upstairs in the pub the room is set up for watching the World Cup soccer game: people are quiet, huge screens on two walls. After that we walk some more, across the river and back, and check out some other pubs for music and atmosphere. As I get increasingly tired the neighborhood of Temple Bar begins to look seedy to me. I begin to see garbage on the street and drunks on every corner, and pretty much a low class life mixing with aimless tourists. This day has been too long for me. When we get home at 10:15, which for our bodies is 11:15, I am too tired to brush my teeth. So the atmosphere between us sours. Another perfect blue sky day, a rarity in Dublin. Breakfast at the Queen of Tarts around the corner (the ‘breakfast’ part of B&B has been lost somewhere with the rise of AirB&Bs). This is the day for exploring the city. The first stop is Trinity College. A nice compact campus in the middle of the city. Established by Queen Elizabeth I, all its buildings are no older than 18 or 19 century when the college grew the most. The half an hour tour is led by a charming undergraduate with a lot of charisma. I am thinking of Steven’s boys using one day their opening to Polish citizenship to study here at low cost. We visit the library with the famous Book of Kells, dating to 800. It is really an amazing document. The exhibit tells its story, shows enlarge pages of the intricate text and decorations. Then we go to the famous “long room” of the library, with vaulted wood carved walls and ceiling, and thousands of ancient texts arranged by …size. Back in the bright cool sunshine, a simple lunch in a small café, and on to the National Museum. It is free and not especially crowded. In the small collection of European masters we find a few great paintings: a Caravaggio, a spectacular Goya, Vermeer’s woman writing a letter, and unknown to us masterful Monet, a few others. The Irish collection is not especially memorable, except for a painting by Jack Yeats, the brother of William Yeats, the poet. We are done in maybe half an hour. Take a rest in the park, I take nap on the grass, Philip reads on a bench. We finally buy a suitcase, after a long agonizing deliberation about the size, then take it with us for the rest of the city tour. We take a bus to another part of town, but here the museum of Writers is already closing. An icecream and a bus ride back to the center. It takes a long walk to get to our lodgings. It is after 5 PM and I realize that again I have done too much for one day. I take a break in the stuffy room, repack, read, Philip cannot stand being in this room for too long, so he goes to the downstairs café and waits for me. The dinner at the Italian restaurant downstairs is very good. It is already close to 9 PM when we finish, but I feel much refreshed, and we go for again to the “Bourbon Street” of Dublin: Temple Bar. At one end of this not very long strip are off-B’dway theaters; perhaps 4 of them. If we had more time I would love to visit Dublin theaters. The repertoires vary from Shakespeare to modern plays and tickets are inexpensive. It would be nice to meet the people who attend theses performances. Toward the other end of Temple Street and Fleet Street the area is a tourist trap, but it is also genuine Irish. In one café a couple is dancing Irish dances to the sounds of guitarist-vocalist. On every street corner there is some kind of music. One street entertainer has a bicycle so constructed that you turn the steering wheel left when you want to turn right. Four Euros for four attempts. Anyone who crosses the finish line (about ten meters) gets a cash prize of 30 Euros. Nobody succeeds to bike even one meter without falling, and the money flows into the man’s pocket like a stream. This is an amazing display of how human brain works. We end the evening in a café where we watch the end of the football match between Belgium and the US. I enjoy the game. Get home pretty wiped out after a long day. I could not fall asleep until 2 AM, then garbage trucks woke me up before seven. I am glad to check out. We do some errands, then pick up the rented car. They sell us more than we planned for, but the car is roomy and drives well. Philip gets out of the city without trouble, driving on the left, and we head north toward Donegal County. The roads are good and very uncrowded. The landscape it like a hybrid of Western MA and Tuscany: green rolling hills, trees marking edges of fields, pastoral. No forests and no charming villages though. Stop at Newgrange, a Neolithic burying ground and other remains of ancient civilizations, like Stonehenge. We realize that in order to see it we would have to dedicate a day to it, so we eat in the cafeteria, look up the maps and photographs, and head out. The next four hours is driving. We cross Northern Ireland, with the border marked only with a small sign that the speed limits and distances are in miles, not kilometers. It seems less prosperous. We pass many small villages that do not have the charm we expected, and are built along the main thruway. Nice small houses, but no village centers. As we continue north, beyond Northern Island and entering County Donegal, the names of village seem straight from the Lord of Rings: Emyvale, Stranorlar, Ballybofey, Castlefinn, Liscooley, Killygordon, Cloghan, and so on. Unreal and impossible to commit to memory. By the now all the signs are in Gaelic. It gets increasingly rural. No cars on the roads. We cross a gentle mountain range. Heavy rain comes and goes. By about six PM we arrive at Sarah and Cathal’ house in Meenacross. They have a beautiful and not very big house, an old cottage that Cathal, an architect, rebuilt and enlarged. The house is a passive house and has its own wind turbine, which makes it overall energy positive. It has a breathtaking view of the bay. Every detail inside the house is beautiful. Cathal [ca’hal] gives us a long tour of the house, which of course is of great interest to me. Sarah has an open cheerful face, laughing eyes, and warm and very welcoming demeanor. We set ourselves up in the guest room – a big bed, a private bathroom, a sense of peace – such a welcome change after Dublin. We spend the evening talking, over appetizers, over dinner, over wine. Talk about everything: personal stories, history, social issues. Philip and I try to understand Ireland, its history, the role of Catholic Church. How wonderful to go to bed, finally. A wonderfully slow morning. Silent house, the sound of wind outside, the light changing continuously. The wind turbine is active. This is a million dollar view from this house. We all take a hike for close to three hours through this wild land. Endless rocky hills and craggy shoreline, mountains on the horizon, wild ocean, abandoned stone cottages slowly decaying in the elements. No trees in this windy land, but everything is very green. Huge clumps of wild blackberry bushes everywhere. This village of Meenacross has a population of a few hundred. There are some older homes and modern homes but all are small and essentially very simple in shape. Like a childhood drawing of a house. All made of stone or brick and finished in stucco or some other cement-like material: gray, white, beige. Simple. No decks or porches in this climate. This used to be agricultural land, with its inferior soil, but now it is unclear how people make their livelihoods. There are sheep and cows, and some vegetable gardens. Perhaps the rest of the people work for the government or a retired. We hike and talk, rain comes and goes, the wind is howling, all feels like Ireland. We pass twelve feet high stone walls whose function is perhaps as a wind shelter. They were built during the potato famine in the mid-19th century as public works program organized by wealthy families. Piles of peat are drying by many houses, to be used as fuel during the winter. Cathal shows me how to harvest that peat. It is surprisingly light. Sarah tells me that the best way is to mix it with coals: coal burns hot and fast, while peat smolders so in the morning it still gives out warmth. Over a late lunch we talk about sustainable consumption and the problems of the world. The tide is retreating, the light changes. After lunch the house gets very quiet. Sara reads a book in the sun room. Philip plans the next few days of the trip, I take a sweet nap and then write in the journal, Cathal is doing something. It is a wonderful afternoon. In the evening we invite our hosts to dinner in the village. We take a scenic route to Dungloe, which is called in Gaelic An Clochan Liath. The food is far too rich for me: a lot of butter and cream and bread. I cringe watching Philip eat big portions of that stuff. We talk and talk: about Cathal’s career as an architect and his restless retirement, about Frank Lloyd Wright, about the catholic history of Ireland, about everything. When we get home I retreat to our lovely room and enjoy solitude while they are still interacting for a while. Late breakfast, more conversation. Goodbyes. We head south/southwest. We drive through moors: desolate and lush at the same time. Occasionally we pas clusters of houses and sheep grazing on hillsides, but otherwise this is a very sparsely populated land. The first stop in a small town of Ardara for coffee. We take it in a pub. It is empty at this morning hour except for four older men at the bar, talking and drinking beer. I cannot understand their dialect. Next to our table there is a set up with mikes and a guitar laying on a chair. It would be nice to be here tonight when the music and singing commence. We spend some time in a sweater shop where Philip buys a very nice fisherman sweater. I try on this and that but do not buy anything. The weather is bad: rainy and cold. After another hour of driving we get to An Charraib, where we have lunch in a small pub. Their soups are really good. I see that one particular type of soup – pureed vegetable – on all the menus, and it is good. 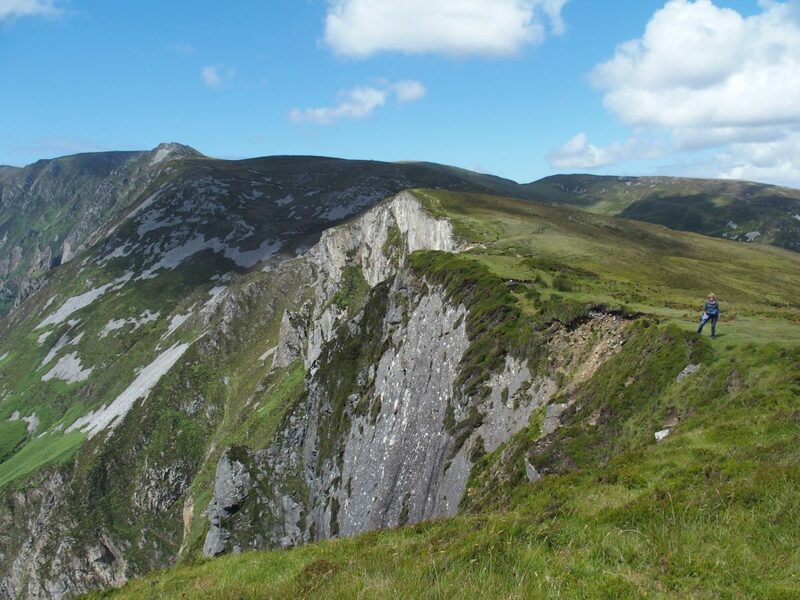 After lunch we move the car to the foothill of the famous cliffs Slieve League and go for a long hike. The cliffs are spectacular, but no more than other such high cliffs we have seen. For example, the cliffs in Capetown. But it is the hike that matters. The rain stops by now and as we climb higher and higher the view opens up. Now we can see the other side of the mountain, with a long deep valley in a distance and a mountain lake right below us. Like “Morskie oko” in Tatry Montains. Because of the wind and the rapidly moving clouds the light changes all the time; the ocean and the rocks and the high cliffs are a kaleidoscope of shades. Cathal told us yesterday that this area is the windiest in all of Europe. It is close to five o’clock when we get into the car again. It is time to find a place to stay tonight. Our destination is Donagal, about an hour’s drive from here. The landscape is like any place. Green, agricultural, ordinary. We pass a town of Killybags, once a thriving center of fishing industry, with imposing fishing ships in the harbor, and half an hour later we arrive in Donagal. It takes us five minutes to realize that this is an awfully touristy place, with a lot of traffic, and that we do not want to be here. So we turn around and retrace our steps back to Killybags. When we get there it turns out that both hotels in the town are booked solid (a big family wedding this weekend). This could turn out to be a disaster but luckily we find a nice B&B which still has a single unoccupied room. The room is large, flooded with light, very inviting. The proprietor used to be a fisherman for twenty years in the Boston area – Gloucester, Narraganset, but now he retired here. Both he and his wife are warm and welcoming. They do not even ask our names or our documents. Just hand us the keys, ask what time we want breakfast, and we are at home. Amazing. Dinner in the hotel next door: simple fresh food, not very interesting, good tasting. They have this special bread in this region, which is baked on baking soda, not yeast. We both like it very much. This is a really small town. I will explore it more tomorrow, but for now I can see that we can walk all its streets in less than half an hour. We both got up under the weather. I could not fall asleep until around 3 AM, and Philip seems to have some bug. We will have a slow day. The weather is, as every day for almost 4 weeks for me already, in the low sixties during the day, cooler at night. But the air is pure and refreshing, and when sun comes out (which it always does, though not for long) it gets very pleasant. We drive about half an hour to Donagal. This morning the city looks much more appealing than last night. In fact, it is beautiful. But we do not stay and keep driving for another hour toward Sligo. The sky gives us the usual spectacle of clouds and shifting lights. The landscape is green, green, green and pastoral, exactly as one would imagine for Ireland. Mountains on the left. One of them looks just like the Table Mountain in Capetown. We stop in Drumcliff to visit the grave of William Yeats. It is an ordinary grave, with an ordinary stone, in an old church graveyard. The site of the church is ancient: an 11th century stone tower, a remainder of the defense system against the Normans. There is an ancient cross-shaped gravestone just as old, the details of its carvings washed smoothed by the ages. Behind the church there is a walking path along a small river on one side and fields on the other side. Hard to imagine a more peaceful place. We walk for a while, then stop in an art studio where the owner is in the process of creating a charcoal drawing. I watch her for a while, intrigued by her technique. The drive from here to Sligo is only five minutes. Sligo is small and beautiful, and we stay for a while, walking and taking tea/coffee at an outdoor cafe. A torrential rain passes by, and is gone in a few minutes. We drive along the scenic coastal route R297 toward Ballina. This is a sparsely populated wild land here. At some point we turn off the road and take a small road, not marked on the map, which hugs the cost. The landscape becomes even more desolate, yet lush, as is always the case in this country. The road is so narrow that only one car at a time can pass here. We stop the car and neck, nobody passes us. This is a cattle and sheep farming region. We drive by houses prosperous and poor, and many very old stone cottages that have been abandoned. First the roof gives in, then slowly the walls chip away until nothing but a pile of stones is left. Many of these abandoned cottages have new houses built right next to them. We reach Aughris Head point, sticking into the Atlantic, beat by the winds. People come here to snorkel. One more stop, in Easty, a tiny village where we have late lunch, served by a sweet lady. This is Saturday afternoon, and there are no people on the streets here. Just a couple of cafes and a pub show any signs of life. We get to our destination for today, Ballina, by about 4:30. This is a bustling small city, full of life at his hour, cut in half by a wide and murky river. This weekend is the beginning of a salmon run festival, and one can feel the energy in the air. Plastic salmons hang everywhere from utility lines. So kitschy that it is charming. There are no rooms for the night to be had in the only hotel in the center; and neither in a B&B, so we go out of town where there are several B&Bs. We settle for a large Victorian manor house where we get a nice room with a bathroom. The landlady Adrienne is just like the one last night: friendly, inviting, warm. We are both ready for a bit of a rest. Philip watches a soccer game in the downstairs parlor while I take a nap. Coming to the center for dinner we discover that this is a working class town, with no tourists, no fine dining, and no gourmet restaurants. In fact, it feels like the economic bottom fell out of it. We are served enormous portions of simple food in the only restaurant in town that is not a fast food joint. Then we watching a soccer game in a small pub, then return to our wonderful lodgings. We decide to stay in these nice lodgings for another night. We are the only guests here. Galway and other places in Ireland will be for another trip. Our guidebook does not even mention this area. We wanted to see ‘real” Ireland, so this is it, including Ballina, with its sluggish economy, working class people, and salmon decorations on utility lines. Today is the coldest day of our trip: barely above the 60 degree guide area mark, and windy. How do people live in this climate? For us this is not bad, much better than a heat wave would be. Today we drive more than we expected, see a few villages – the medieval Killala is a gem, with an ancient tower, cozy streets and colorful charming houses. The highly recommended by our landlady Belmullet, on the other hand, at the end of a remote peninsula, is a dud; a dead town whose economy lost its footing some time ago, and store windows display unbelievable junk. Driving to these towns, seemingly not far from each other on the map, drives home the realization that this is an enormous land. Narrow roads are virtually empty of traffic, and the human settlements are as sparse as they were thousands of years ago. In fact, little has changed here since 6000 thousands of years ago when people came to this land from England and the mainland Europe. This was the last place in Europe where agriculture became a way of life. We visited the Ceide Fields, an amazing place which preserves the settling patterns of people who lived here 6000 years ago; and after 500 years had to leave because of climate change; so the fields and stone walls became eventually covered with peat. When the Stone Age settlers arrived 6000 years ago this was a dense pine forest at the edge of wild cliffs over the open Atlantic. The guide in the Visitors’ center told us that the weather was warmer here than now. So these Neolitic people cut down the forest and lived peacefully from agriculture, cattle and sheep farming, and fishing. Not much hunting, as the large game never made it to Ireland from the rest of Europe before it had become an island. There were no wars, either from the outsiders or among the people of this region. They must have had plenty of food. After they cut down the forest the acidic soil and rainwater created the soil conditions not favorable for decomposition of plants (not enough oxygen), so the plants and grasses decomposed very slowly, basically rotting in the anaerobic environment, thus creating turf (they call it bog). Ten centimeters per century; one meter per thousand years. In some places there are 5-6 meters of this turf here underground. It is still widely used for household fuel. People just dig narrow trenches to retrieve it, using some kind of a tool that gives it the shape of sausages, dry it in the open air during the summer, and use it all winter long. We encounter a multitude of these trenches lining up this huge land. After about half a millennium of intense agricultural activities the climate changed and people moved away. Another reason for the move was that the soil conditions changed: as a result of the water movement through the soil (plenty of it in the absence of forest) the iron washed downward and eventually formed an impenetrable shelf, thus reducing the drainage capacity of the soil. People left but the process of turf formation continued on its own. The forest never came back, probably because of the howling winds. The turf buried and perfectly preserved the remains of that ancient civilization: snow-white stone walls around the pastures and houses, the elaborate structures for burials, and (though so far never found) human bodies. Comparing the drawings of the ancient stone walls we saw in the visitor center with todays’ low wire fences between the fields one can see no difference in how the land has been used for millennia: the same remoteness, the same scattered tiny settlements, the same huge fields on rolling hills. It is really amazing to be in the Ireland of today and of thousands of years ago at the same time. So we saw it, and we experienced it, and we drove too much. And now we are ready to go home. This is the last evening in this sleepy town of Ballina. Tomorrow we drive to Dublin. We stay for some time in a very nice pub called The Loft, frequented by people of our age, sitting in small groups and talking. No television, no music: just people visiting with each other. After a couple of hours of driving in the morning we stop at a Museum of the Great Famine in Strokestown. The museum gives a lot of information but it all does not come together into a coherent story. The famine of 1845-47 was unbelievable. 2.5 million people either emigrated or died (about a million died). The story we piece together is that it was a toxic mix of many factors coming together: backward uneducated peasants, exploding population, changing economy of Europe after the Napoleonic wars, exploitation by England, lack of good governance and effective institutions in Ireland, and the ruling classes totally uninterested in modernization, scientific advancements or social progress. This trip really has enlightened us on many aspects of Ireland and its history. We arrive in Dublin in midafternoon, find our AirB&B located at the very center of Temple Bar (very nice accommodations but three flights of stairs with no elevator), unload the luggage and proceed to return the car. Driving through Dublin is a nightmare because of all these one way and dead end streets, forbidden right turns, and no advanced warning about it on the map. But with Philip’s sense of direction we somehow make it. After some nice rest we have dinner in the same Italian restaurant as on the second day of the trip, then go to Temple Bar for the last time. The theaters are holding performances, the pubs are full of people, mostly young, more than half of them tourists. People drink but not excessively. We make our way to three different pubs on a single pint of Guinness which we share. The music is great. These kids know all the words to all the songs and pretty soon everybody is singing together. It is a wonderful atmosphere of pure exuberance. We catch the mood and have such a very good time, also singing, sometimes sitting on a bench in front of a pub, listening through the wide open windows. I do not want to go back to the room but I am too tired to go on. A great ending to the trip. The bus to the airport comes every 15 minutes to the bus stop 5 minutes form our guest house. It is all so easy. Philip sends me off on a 10:50 flight to NYC, then catches his own flight to Boston an hour later. After 5 weeks in Europe and am happy to be going back.